It’s said that no Brazilian meal of grilled meats, (churrasco), would be complete without a potato side salad. 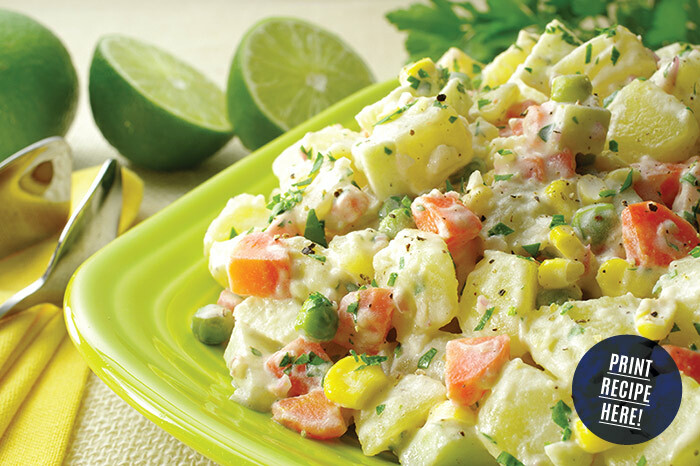 While many variations of potato salad exist in Brazil, (as they do everywhere), the standard formula includes carrots and peas, and a generous dose fresh lime juice in the dressing. Optional add-ins include corn kernels, diced hard-boiled eggs, green apples, or even raisins. For our version, we’ve incorporated “the basics,” then added corn and green apple opt-ins to the standard profile. The apple is a particularly nice, crunchy, tart addition that blends perfectly with the zingy lime dressing. 1. 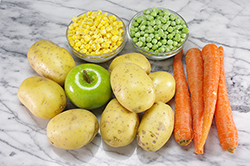 Prep potatoes and carrots by peeling and dicing. 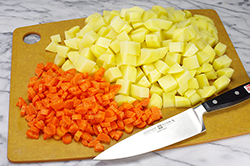 Cut the peeled potatoes into 3/4-inch cubes, and the carrots into 1/2-inch half moons. 2. Bring a large pot of water to a boil and salt. Place the potato cubes in the boiling water for 10 minutes. Add the carrots and continue to boil until both are just barely tender to the tip of a knife. Add the peas and corn and boil for another minute. 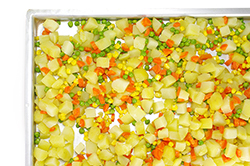 Drain the vegetables in a colander, then spread them on a large rimmed sheet for quick cooling. 3. 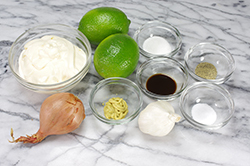 Mix the dressing by prepping the garlic and shallots and placing in the lime juice to soften. Meanwhile, whisk the mayonnaise, mustard, Worcestershire sauce, sugar, salt, pepper, and parsley together. 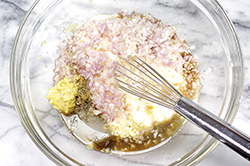 Add the garlic, shallots, and lime juice, whisk again. 4. When the veggies reach room temperature, add the diced apple, and pour the dressing over all; toss to coat evenly. Serve or refrigerate for up to 2 days.